The main subject of Piero Santini’s second book, The Forward Impulse is the action of the hand and its relation to the natural forward balance of the horse—the forward thrust from the haunches—typical of the Italian School advocated by his teacher, Federico Caprilli. Santini elaborates on the correct use of balance, the rider’s legs, use of the hand, in many disciplines including indoor and outdoor riding, jumping, steeplechase, racing, polo, and even side-saddle. The Forward Impulse describes in simple language how to balance the horse through engagement of the haunches, enlightened use of the seat, and conscientious elasticity of the hand. Not one in a hundred riders has access to the kind of teaching that focuses on controlled energy of the haunches. 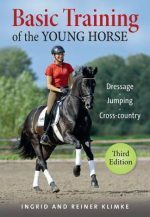 This book puts the focus where it belongs: first on the engine; then, on the system of aids that manages that power to create an opportunity for the horse to express himself with magnificent gaits. Xenophon Press is proud to offer the opportunity for riders to see for themselves how logical and systematic this dream can be. The great master Piero Santini was not just a great jumping rider, but a great rider in all disciplines, during a time when the line between disciplines was blurry, and in Santini’s case, nonexistent. During his lifetime, Santini was considered the greatest riding teacher in North America, bringing his direct knowledge from Caprilli, the inventor of forward seat jumper riding.